Congee is a well known and popular dish all over China. 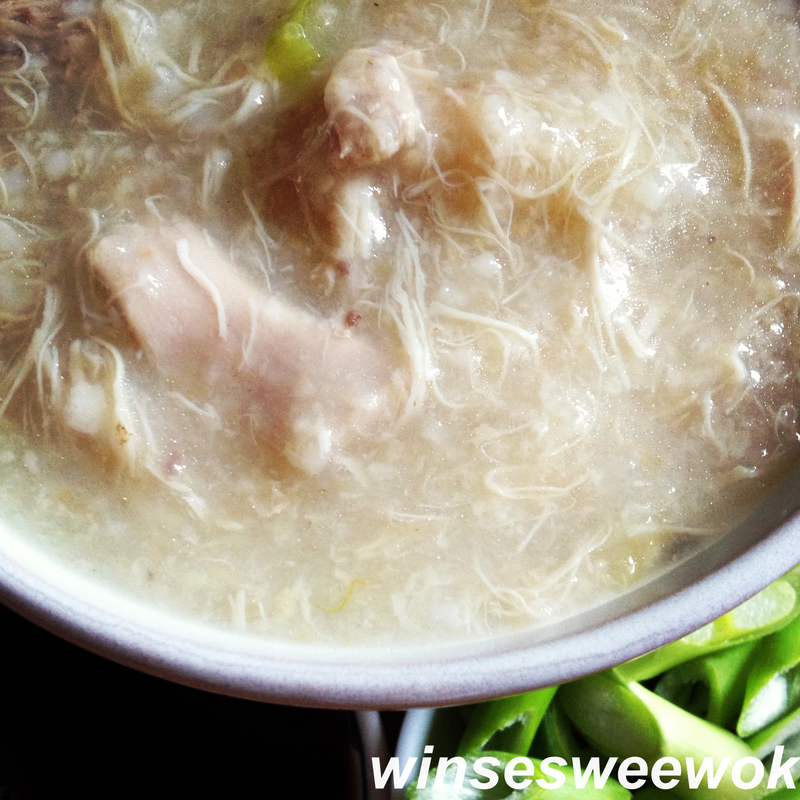 It is basically boiled rice, reduced to a soft, silky texture resembling porridge. It is ideal and most eaten for breakfast as a hot porridge or as a snack or lunch. Congee is also often made by mothers for when their children are ill and for babies. 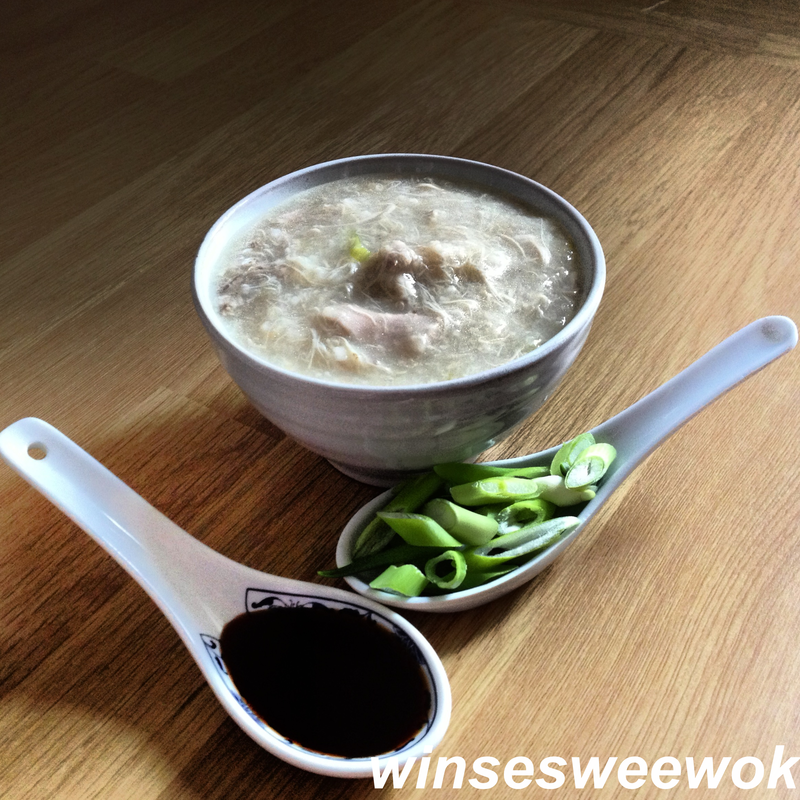 This is because congee is easy to eat and easy to digest. The rice is broken down completely. This provides nourishment due to loss of appetites and also as fuel due to the carbohydrates. In this recipe I have introduced chicken, plain but very nourishing with alot of natural flavours from the bones of the chicken. This really is a fantastic congee, a nourishing bowl warmths the body, a great hangover food, good for boosting the immune system and most of all congee cleanses the gut. So what are you waiting for? Get cooking! Wash and rinse rice 4 times under cold, running water. In a large, deep pot add in 2 litres of hot water, chicken powder, vegetable oil, rice, salt, pepper, sprigs of spring onions and ginger slices. Soak for 20 minutes. Remove skin from chicken thighs and place into the rice pot. Give the ingredients a stir. Partially cover the pot with a lid, bring rice contents to a boil on a medium/low heat for 30 minutes, stirring occasionally at every 10 minutes intervals to prevent rice from sticking to bottom of the pot. Lower heat to a simmer after 30 minutes and simmer for a further 10-15 minutes. Cook until the rice has broken down to a thick soup. Remove chicken thighs from pot, shred finely and return meat to congee pot. Stir the pot to ensure the shreds are mixed with the congee. Spoon two or three ladles of congee into a bowl. The congee is ready to serve but is best serve along with the extra garnishes on top. Note: After 30 minutes, you can add ¼, ½ or ¾ litre of hot water into congee pot that’s if you prefer your congee to be less thick and more watery. Use cups of hot water as a guidance to judge the consistency of the congee to your preference.